Lucid Dreams In 3D Sound Guided Meditation "pure magic"
may you never be the same >> Lucid Dreams In 3D Sound Guided Meditation "pure magic"
High Quality 2 CD Set! 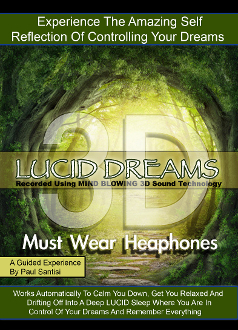 CD #2 - A wonderful guided meditation into the World of Lucid Dreaming by Paul Santisi. This audio will get you relaxed and bring you to a state of awareness while you sleep. This is th emost powerful and effective audio that will have you Lucid Dreaming like never before. Recorded using MIND BLOWING 3D Sound. Must wear headphones to experience the 3D reality. YOU WILL LOVE IT! A truly amazing journey into the self.